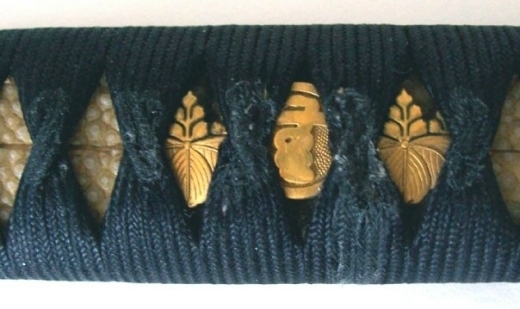 This is a gunto tsuka that I rewrapped for a client in the Type 98: Ikkanmaki style - a shin-gunto variation of the Katatemaki style (http://www.h4.dion.ne.jp/~t-ohmura/gunto_005.htm). 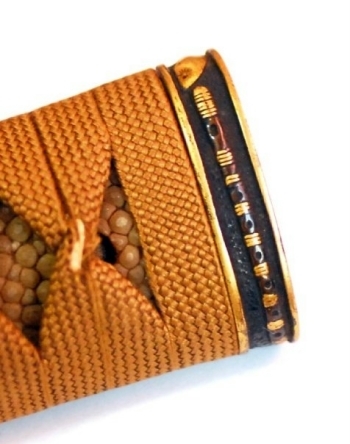 The custom aspects of this work include urishi lacquer ontop of the ito, and menuki placement. 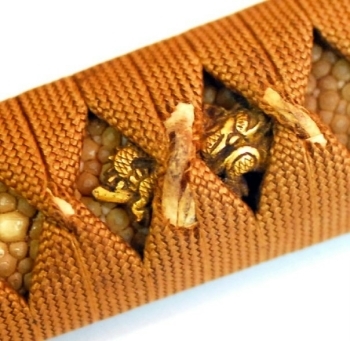 I am posting two pics of an older tsuka that I was recently working on. 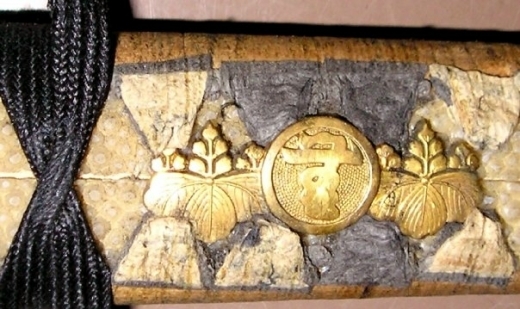 These photos illustrate the use of darker paper during wrapping, which is strategically placed around the menuki to lift the ito and hide the edges of the white papter wedges. The first image is a before shot, and the second one was taken during disassembly. 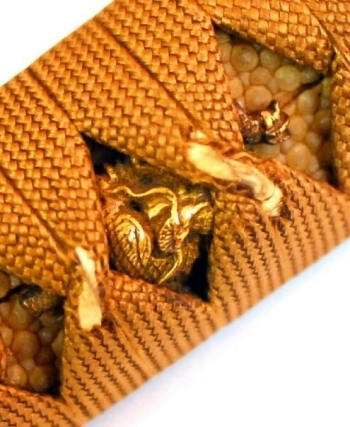 This was recently brought up during a discussion with Keith Larman, he suggested that the darker paper might have been used to help the menuki "stand out" visually apart from the samekawa as in your first photo. Kinda of like creating a "shadow" background for the light colored menuki. 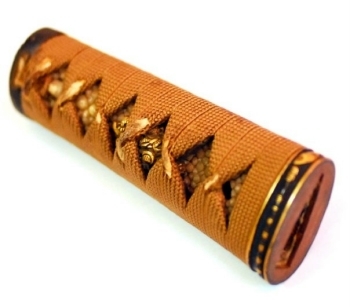 Keith also said that he tends to use paper that matches the color of the ito regardless for hishigami. Although old and worn, this is a nice study piece. Skillfully executed lines with consistent, regular openings. Just thought I would share. 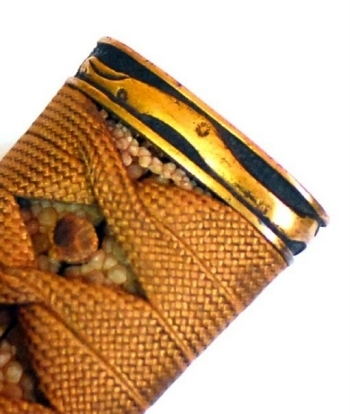 In the above photo, notice that the first crossover is "pinched" instead of twisted. FYI, this was posted on ebay, sold for $212. on 6/16. I always enjoy pulling blades out of storage for cleaning and appreciation, especially if I haven't really looked at them in a while... It is almost like being introduced to the swords anew. This is a perfect example, it has been a little over three months since the last time I looked at this tanto. I have had this piece for a little over 6 years. 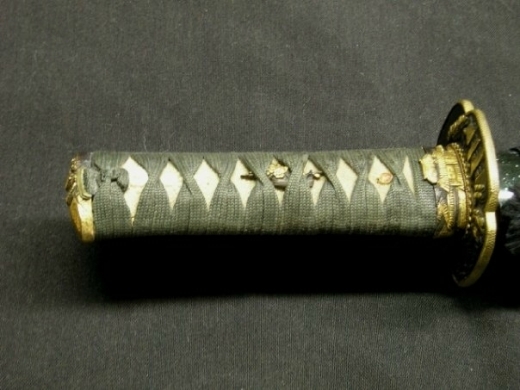 About 2 years ago, a friend said that he saw a katana mounted with a nearly identical fuchi in Chicago... 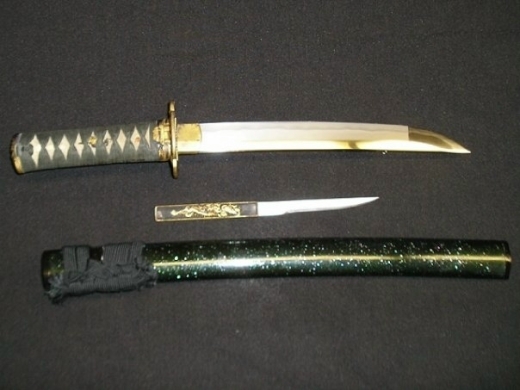 If anyone knows anything about that blade, let me know. 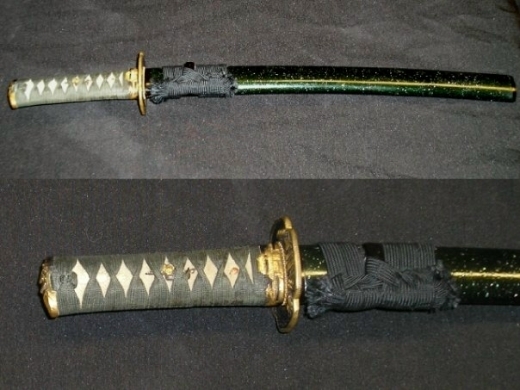 Otherwise, let me know what you think of this blade. 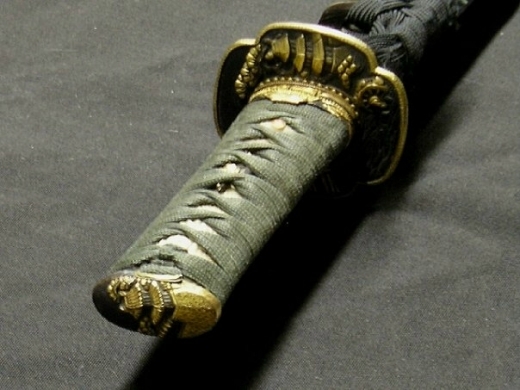 As for the specs, it's a late Edo period tanto mounted as a wakizashi; all original mounts and in full polish; abelone saya with matching fuchi/kashira/tsuba/menuki - lots of gold.